Imagine if you could live in a hotel. Not just any hotel, but one where each of the rooms had a different theme. If you like cuddly toys, you could live in a room full of cuddly toys of every size, colour and type. If you like Playstation, you could live in a virtual reality room where you could be a character in any game you chose. In Patrick Carman’s new book, Floors, Leo lives in the weirdest, most wonderful hotel in the whole world, the Whippet Hotel. Leo Fillmore and his father Clarence live and work at the Whippet Hotel as the caretakers, making sure everything is in working order. The hotel’s eccentric owner, Merganzer D. Whippet disappeared one hundred days ago and hasn’t been seen or heard from ever since. This leaves the mean hotel manager, Ms. Sparks in charge of the hotel, and when the hotel doesn’t work as it should, everybody hears about it. Leo spends his days helping his father maintain the hotel and making sure Betty and the other ducks get walked. One day, as Leo is returning the ducks to their pond on the roof, he discovers a mysterious box in the duck elevator. This box is the first of four that will lead Leo to discover the secrets of the Whippet Hotel and the mystery of the missing Merganzer D. Whippet. 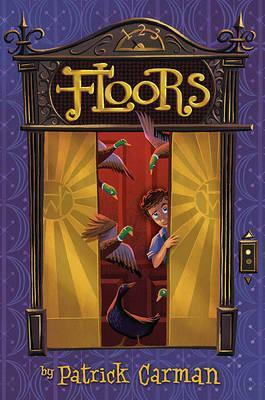 Floors is full of wonder, mystery and mahem, and made me smile the whole way through. Patrick Carman has created this weird and wonderful hotel and filled it with one exciting room after another. There’s a Pinball Room, which is set up like a pinball machine, with bowling balls as the pinball and couches for the flippers; the Cake Room filled with real cakes that are delivered by the chefs each morning; and the Central Park Room which contains a scale model of New York’s Central Park. The characters are just as weird and wonderful as the hotel. There’s Captain Rickenbacker who thinks that his arch-nemesis is out to get him, the obsessive writer, Theodore Bump, and the nasty hotel manager Ms. Sparks. Floors is one of the most fun, imaginative stories you’ll read this year. It’s perfect for fans of Roald Dahl and Lemony Snickett. Sounds like a fun read even for an adult. Books can sure take you on a wondrous journey.